Stockholm (AFP) - A carpet of flowers, candles and stuffed toys on Sunday covered the steps of a Stockholm shopping plaza where up to 50,000 people gathered for a vigil honouring the victims of last week's truck attack. "We talk, we don't fight," Marianne said just a stone's throw from where the lorry mowed down shoppers before slamming into the facade of a popular department store, killing four people and injuring 15. A 39-year-old Uzbek suspected of carrying out the attack had previously been refused residency in Sweden and had "shown sympathies for extremist organisations" such as the Islamic State group, the police said. Although the motive is not yet known, the method resembled previous terror attacks using vehicles in Nice, Berlin and London, all of them claimed by the Islamic State (IS) group. "I think it's very important to stay strong together, against anything that endangers our society which is based on democracy," Marianne, who attended the vigil under sunny, spring skies with her elderly mother, added. A woman handed out roses to two police officers guarding the square. Mikael Berggren, a 36-year-old from Stockholm who brought his two children aged one and three to the vigil, said he would continue to live his life normally. "They're too young to understand what happened," Berggren told AFP as he gazed towards his children. "The attack will not change anything." Called the "Love Manifestation", the vigil was created as an event on Facebook and attended by politicians, activists and performers. Flags were, meanwhile, lowered to half mast in the normally vibrant city. Karin Wanngard, Stockholm's mayor who spoke at the event, described the city as "open, loving and tolerant". "Horror cannot prevail, horror may never win, we will win instead...(with) openness and kindness!" the Social Democrat said. Daniel Holl, a 31-year-old German researcher living in Sweden, said he joined the rally to make a stand for unity among nations hit by attacks in recent years. "Whether it's Berlin, Brussels, Paris or Stockholm you feel the same, it has nothing to do with nationality," he told AFP. Gurgi Singh, 31, who moved to Stockholm from India a couple of months ago to learn Swedish, said he was not worried the attack would divide or polarise Sweden. "Sweden or Stockholm is very supportive and people are always welcoming and helpful," he told AFP. "If it's going do anything its going to make it more stronger than divided," he said, referring to Friday's attack. 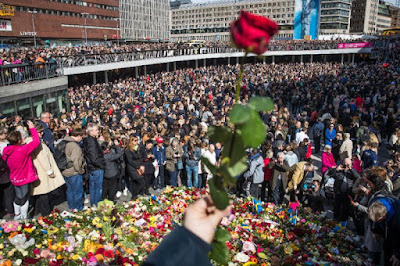 For Charlotte, a Stockholm resident, the attack brought people closer even if they didn't always show it. "This is the capital of Sweden, a lot of people are busy, running around, and we don’t even have time to say 'hi' sometimes because we are on the go," she told AFP. "This is so nice to see that people really care, even if we don't show it everyday, you do care for the people around you. ".